N Seoul Tower in South Korea is a landmark of the metropolitan city of Seoul. The tower is located on the peak of Namsan in Seoul, a city of more than 10 million people. It is embraced in the history and culture of Seoul for the last 25 years. 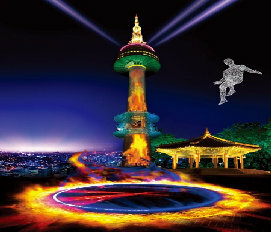 In 2005, the tower was reopened as N Seoul Tower. Why Is N Seoul Tower A Popular Landmark? A panoramic view of the entire city and the natural beauty of Namsan Mountain unfolds before you here. Owing to the tower's unique structure, the observatory section offers versatile views as the seasons change the appearance of Namsan Mountain. In addition to the colorful scenery of the mountain, N Seoul Tower in South Korea was renovated in 2005 with newly designed high-tech multimedia. The Tower now provides a new cultural space in the center of the city. A must visit landmark for an unforgettable experience and the best place to view the city with its convenient facilities and beautiful surroundings. The observatory is bursting with interesting facts and information about the city. The high technology will facilitate and add more fun to your visit. In fact, it is popular as a dating spot where you can enjoy dinner while appreciating the view of the Han River and the city's colorful night lights. It is therefore very popular tourism landmark as well as with young local Koreans.